British Motorcycles and Royal Mail began riding together in 2005. Royal Mail selects a theme every year to launch a special Stamp Calendar and in 2005, the theme was British Motorcycles. 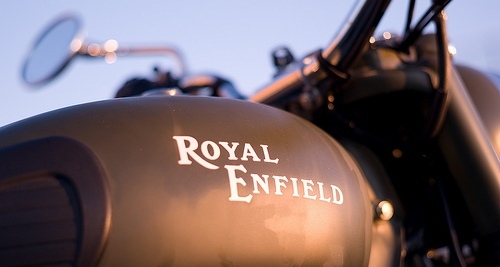 For most of 20th century, Britain was a world leader in motorcycle development and manufacture. Royal Mails celebration of the UK motorcycle industry was illustrated with a wide range of manufacturers, and the machine on each stamp represented a major leap forward in design at the time. The Royal Enfield 1914 model, which was a small engine motor bicycle, had been showcased on a 68p stamp. The other motorcycles that were alongside were the 1930 Brough Superior - bespoke luxury motorcycle, 1937 Triumph Speed Twin - two cylinder innovation, 1949 Vincent Black Shadow - fastest standard motorcycle, 1969 BSA Rocket 3 - only three cylinder superbike and the 1991 Norton F1 - road version of the race winner. You can check out more information on this Stamp Calendar at the Royal Mail website.